Such a shape would be useful, for say, creating a “Document” shape. It’s also the type of thing that the CAD-oriented folks might like to create, only they would call it a “chamfer”. In this article, we’ll show you how to create such a shape with Visio’s drawing tools, and to add the special behavior using Visio’s ShapeSheet interface. Ever need a spiral shape? I just found one buried on my hard-drive — something I whipped up years ago, and modified last year. You can download it here. 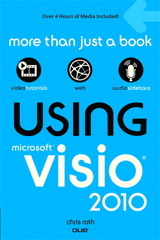 The download consists of one Visio drawing file (.vsd). This file contains VBA (Visual Basic for Applications) macro-code that generates the spirals. 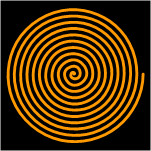 You’ll need to allow this code to run in order to create spirals. How many of you remember waaay back to Visio 2000, when you could manipulate the type and direction of connection points via nifty UI handles? Well, that functionality was removed from Visio, but I’ve created a free tool that will give it back to you! Using a custom master shape and Visual Basic for Applications code, you can quickly get your 2D connection points in order! If you work with different systems of units, you may have a need to convert ShapeSheet values to different units, without changing values. But when you Show Values in the ShapeSheet how can you specify exactly which units to use?